The weather this week has been cold, wet and grey and that makes me want to hunker down with something warm and comforting to eat! 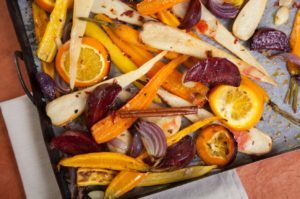 Fortunately, root vegetables such as parsnips, potatoes and swede are at the best right now, which is ideal for a hearty Sunday roast or delicious chicken casserole. Eating seasonally isn’t always possible or practical, but there are a number of compelling reasons why it’s good to do so at least some of the time. Fruit and vegetables which are in season in the UK are likely to have been grown locally, which means reduced food miles. Food miles is a complex issue, but eating food locally produced and in season is most likely to have the smallest environmental footprint. The nutritional quality of fresh food degrades over time, so the longer the journey the food has, the less nutritious it is by time it reaches your plate. Food that has travelled will probably have been picked when it’s not ripe, so generally doesn’t taste as good. I’m sure we’ve all had the punnet of ripen-at-home soft fruit that never really softens and is almost entirely tasteless! Finally, seasonal food is also often cheaper because it hasn’t had to be shipped from all around the world, and if you buy locally, you’re also supporting local farmers. Try a local farmers market – if there is one near you, it can be a great place to pick up good value local fruit and vegetables. Buy frozen fruit and veg – from a nutritional perspective, this can be better than fresh as produce is often frozen immediately after picking which retains higher levels of nutrients, plus it’s really convenient!